I finally completed downloading gridded daily average global surface air temperatures based on initial condition output for the Sigma 0.995 level from the National Centers for Environmental Prediction and National Center for Atmospheric Research Reanalysis 1 (NCAR R1) cooperative effort. This output is still being updated daily about 2 days behind the current day and extends back to 1948. The NCAR R1 model daily temperature grids are composed of 2.5 degree latitude-longitude sectors covering the entire globe (73 by 144 grid cells). The Sigma 0.995 level corresponds to the pressure altitude at 99.5 % of the surface air pressure, which is roughly about 50 meters above ground level. The actual height above ground level varies somewhat depending on atmospheric conditions. I compiled daily averages for the globe [90N-90S], northern hemisphere (NH) [0-90N], southern hemisphere (SH) [0-90S], and five latitudinal zones: Arctic [60N-90N], Northern Hemisphere mid latitudes (NH Mid) [30N-60N], Tropics [30N-30S], Southern Hemisphere mid latitudes (SH Mid) [30S-60S], and Antarctic [60S-90S]. Note that each polar zone only covers about 7% of the earth’s surface and each mid-latitude zone covers about 14%, while the Tropics, NH, and SH zones each cover about 50% of the global surface area. The methodology and data sources are described in my previous post. Prior to the satellite era, which began in earnest in the 1970’s, temperature data were much more sparse, especially over the oceans, but this issue also impacts all other approaches for estimating global and zonal temperatures and temperature anomalies. I have calculated temperature anomalies for the NCAR R1 data set as described in the previous post. So for this post I am presenting the direct mean surface air temperature (MSAT) estimates output by the reanalysis coupled atmospheric-ocean-land modeling. Figures 1 through 9 present the global and zonal daily MSAT averages since 1948 along with running 365-day averages to help highlight the general trends over time. Pronounced annual seasonal temperature cycles are evident in each graph. Click on any graph to see a larger copy. For a closer examination of temperatures during the current century so far (beginning 2001), I am providing Figures 9 through 14. These graphs are in the same format as the previous graphs, but show more detail because of the much shorter time span. In the last set of graphs below I have isolated the 365-day running mean temperatures for comparison. Click on any graph to see a larger image. I will let the graphs speak for themselves rather than trying to offer any interpretation. I have been downloading the daily average global surface air temperature data initial condition output for the Sigma 0.995 level from the National Centers for Environmental Prediction and National Center for Atmospheric Research Reanalysis 1 (NCAR R1) cooperative effort. This output is still being updated daily about 2 days behind the current day and extends back to 1948. So far I have downloaded and processed the daily temperature output back to 1979. The Sigma 0.995 level corresponds to the pressure altitude at 99.5 % of the surface air pressure, which is roughly about 50 meters above ground level. The actual height above ground level varies somewhat depending on atmospheric conditions. The NCAR R1 model uses a 2.5 degree latitude by 2.5 degree longitude grid. In this post I am comparing the resulting global mean surface air temperature anomalies (GMSATA) for several time periods and different reference baseline periods. See the Methods section at the end for calculation details and links to sources. The first two graphs, Figures 1 and 2, display NCAR R1 daily average GMSATA time series output for two different reference baselines. I was expecting the older 1979-2000 baseline to show higher temperature anomalies than the much more recent 2011-2015 baseline as can be seen in the graphs, but I was surprised that the baseline shift also changed the seasonal pattern across each year. Apparently the seasonal patterns have shifted from one baseline period to another. Figure 3 is provided to compare the daily average 2-meter above ground level surface air temperature anomalies from the more modern Climate Forecast System Reanalysis (CFSR) to the NCAR R1 output. The CFSR has a higher resolution of 0.5 degree latitude by 0.5 degree longitude. See the Daily Updates page, which can be accessed from the menu bar at the top of this page, for more information about the daily CFSR output. Click on any of the graphs to see a larger copy. I also calculated GMSATA for two other reference baseline periods, 1994-2013 and 1981-2010. The time series results for all four reference baseline periods for 2018-2019 are plotted together in Figure 4. They all converge around January-February and diverge the most around September-October. I’m not sure why. I included the 1994-2013 reference period used by Nick Stokes for reporting daily averages here and the 1979-2000 period used by the University of Maine Climate Reanalyzer here. The 1981-2010 period is the most recent three decade (30-year) period commonly used for climatological data reporting. I previously used the 2011-2015 period for comparing monthly NCAR R1 versus CFSR temperature anomalies here. The next three graphs, Figures 5 through 7, are like the first three graphs, but covering a longer time period, from 2014 to 2019 so far. Again the general patterns are similar, but the details differ. The last two graphs in Figures 8 and 9 cover a longer time period, for the current century so far, beginning in 2001. I do not yet have CFSR daily averages for all of this period, so only the NCAR R1 results for two different reference periods are presented. Overall, this exercise goes to show that changing reference baseline periods for daily GMSATA does cause quite a bit of variation in the results – more than I expected. However, the general trends as indicated by the running 365-day averages did not appear to be affected by changing baselines. For the NCAR R1 daily averages I downloaded the gridded Sigma 0.995 level temperature output which is provided in compacted annual files (thanks to Nick Stokes for providing the link below on his blog). I used the National Aeronautic and Space Administration (NASA) Panopoly program to extract the temperature grids from the compacted data files and then loaded the daily temperature grid data into spreadsheets by year. For each day I calculated daily averages by latitude zone, weighted by area, to compile zonal and global averages. I calculated the reference period baseline averages for each day and used centered running 5-day averages to smooth the baseline results. Once the reference baseline temperatures were calculated, the temperature anomalies were calculated for each day by subtracting the reference baseline value for the day from the actual daily temperature average for that day. For the temperature anomalies I also calculated running 365-day and 91-day averages to show annual and seasonal scale tendencies. I have updated all of the graphs in Figures 1-9 to the latest available date in order to match additional graphs provided below in Figures 10-13. I am adding Figures 10-12 to present graphs of the 1994-2013 baseline results for comparison with corresponding graphs above using 2011-2015 and 1979-2000 baselines. Figure 13 shows the actual baseline global mean surface air temperatures (GMSAT) for consideration regarding Figure 4. As in that figure, the different baselines show a convergence for December through February and a divergence that peaks around August to October. I am not sure how much is a real atmospheric change over time, or how much could be some kind of artificial change induced by variations in the input data over time. Figure 14 shows the difference in the GMSAT from the 2011-2015 baseline minus the 1979-2000 baseline. The largest increases since 1979-2000 were from August to October and the smallest increases were in January and February. 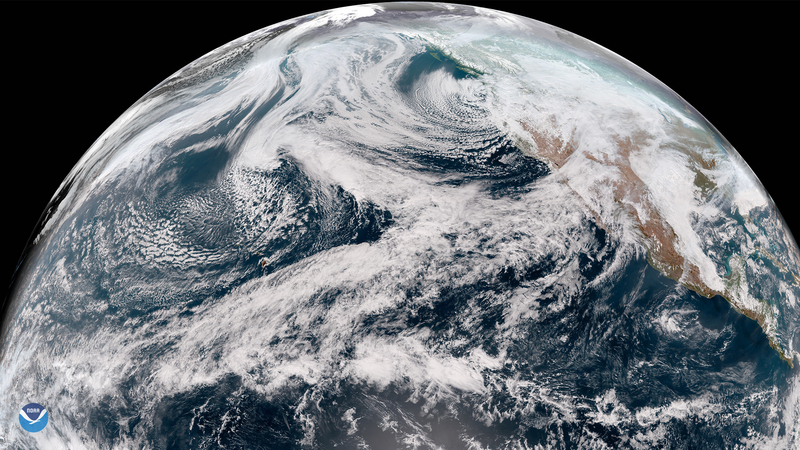 I am not certain if the distribution of these changes is dominated by real atmospheric changes or if there are significant artificial changes induced by changing data inputs over time that influence the seasonal distribution and magnitudes. As I process additional NCAR R1 output back to 1948, I plan to evaluate and compare some additional reference baselines, including overlapping 3-decade baselines beginning with 1951-1980. 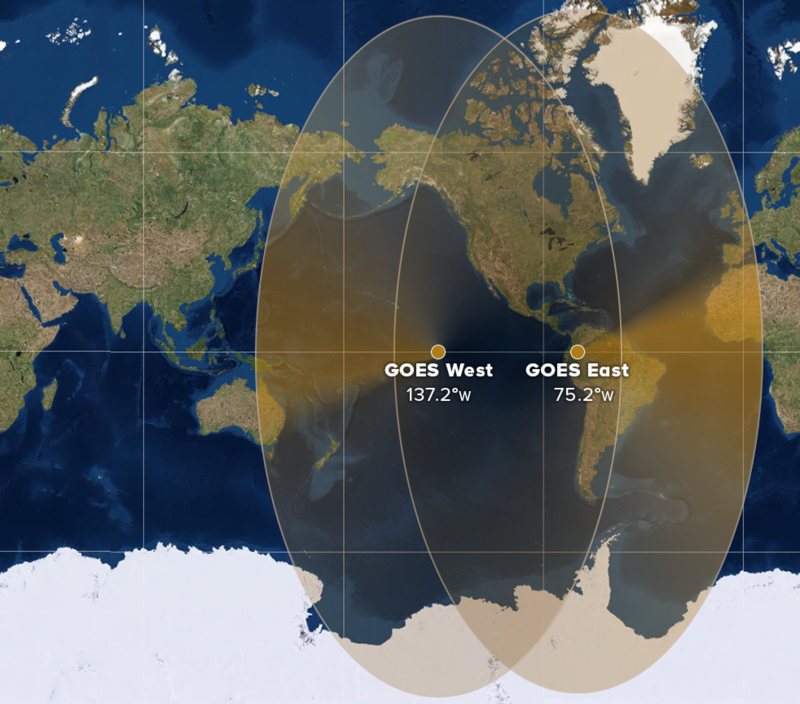 I also plan to look at the baseline variations in the hemispheric as well as 30 degree latitude zones and the results will be presented in future posts. I finished loading and processing all of the NCAR R1 daily GMSAT data back to 1948 and I am adding below some additional baseline comparisons. Figure 15 compares the effects of using different baselines to evaluate the last year of daily GMSATA, similar to Figure 4 above. Here the baselines compared are overlapping 3-decade periods from 1981-2010 back to 1951-1980. Figure 16 compares the actual baseline daily GMSAT averages for all of the baselines I have analyzed so far, including those previously provided in Figure 13 above. Figures 17 and 18 show the daily GMSAT changes from subtracting different baselines for the periods indicated in each graph. In conclusion, it is apparent that changing baselines does effect the seasonal patterns in the daily GMSATA results, but does not effect the general annual patterns as indicated by the running 365-day averages. I’m adding two animated GIF graphs to better illustrate my conclusion above. The animations in Figures 19 and 20 compare NCAR R1 daily GMSATA referenced to 2011-2015 in comparison to 1994-2013 and 1951-1980 baselines respectively. Notice that the running 365-day average pattern does not change as the baseline changes, but the seasonal patterns change significantly. I suspect that some of the seasonal changes are real and at least part of the changes are artificial because of changing data inputs over time (especially for periods prior to satellite observations, such as the 1951-1980 baseline). Click on either figure to see a larger copy by itself. And its all YOUR FAULT!!! Say the Chicken Littles of today. Mostly for pride, prestige, fame, and funding. And to promote potentially catastrophic policies. All in the false pretense of “green” and “renewable” energy. Endeavors that will enrich the Chicken Littles promoting them. Ironically these policies are not likely to stop climate change. But will instead impoverish and endanger most of us. Wasting huge amounts of hard earned tax payer dollars. Chicken Littles of the world are in a class of their own. Not subject to the rules they espouse for the rest of us. They say we must quit using fossil fuels. Flying in private jets. Living in huge walled mansions. Driving expensive cars. Living lavish lifestyles. All provided by fossil fuels. Climate change is now blamed for almost everything bad. Never mind digging for real causes that are ignored. Consequently, “climate change” has become a religion. We must have faith in the sacred climate models. Never mind that they have not been validated. The unfaithful are persecuted as “deniers”. When will the gullible public learn? When lies are told often enough. They are perceived as truth. 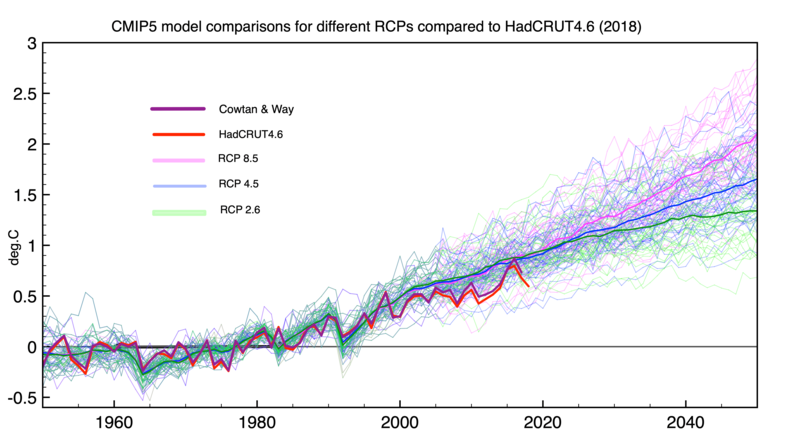 The graph below provided by Clive Best compares global surface air temperature anomaly projections from a large number of climate model runs for different Representative Concentration Pathways (RCPs) for carbon dioxide versus two estimates of global surface air temperature anomalies based on actual temperature measurements from Cowtan and Way and the UK Hadley Climate Research Unit Temperatures (HadCRUT4.6). 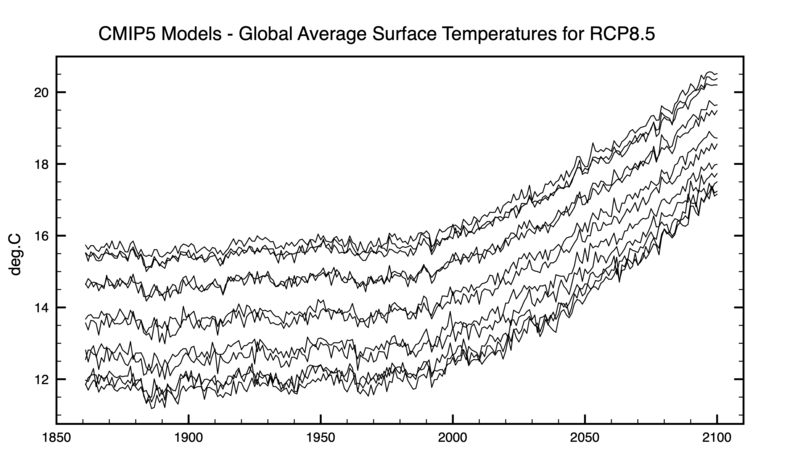 Notice that the measurement based estimates are indicating global temperatures at the low end of the model projections. Another graph from Clive Best below shows direct climate model output of projected global average surface air temperatures, indicating a very wide range in temperatures that is hidden by using temperature anomalies in the graph above. Another sign that the climate models are not representing the real world very well. Graphs sourced here, thanks to Clive Best. I thought it would be an interesting exercise to look at the annual change in global mean surface temperature (GMST) in the atmosphere at 2 meters above ground level versus the annual change in solar radiation incoming (SRI) at the top of the atmosphere (TOA). The earth’s orbit is slightly elliptical. Eccentricity is a measure of the departure of an ellipse from a true circle. The earth’s eccentricity varies over long time scales and is estimated to have ranged from a low of 0.000055 to a high of 0.0679, with a geometric mean of 0.0019. The present eccentricity is 0.017 and decreasing very slowly. That doesn’t seem like much, but the earth’s distance from the sun currently increases by 3.4% over the course of a year from the minimum distance in early January to the maximum distance in early July. That variation in distance causes about a 6.8% increase in TOA SRI relative to the minimum amount at the greatest distance in early July in order to reach the maximum amount at closest distance in early January, assuming a constant output of radiation from the sun. The US National Aeronautical and Space Administration (NASA) Clouds and the Earth’s Radiant Energy System (CERES) measurements from satellites include TOA SRI. I downloaded monthly CERES TOA SRI for the period from March 2000 through July 2018. I also have compiled monthly estimates of GMST from the Climate Forecast System Reanalysis (CFSR) output of initial conditions four times per day, with monthly data prior to 2010 provided by the University of Maine Climate Change Institute (UM CCI) and data from 2010 through 2018 calculated from the Climate Data Assimilation System (CDAS) output of 2-meter surface air temperature. A time series graph comparing TOA SRI with GMST is provided in Figure 1 below (click to enlarge). It shows the annual cycle of GMST with a peak in July and minimum in January, whereas the TOA SRI peaks in July with a minimum in January – the complete opposite. At first, this seems counter-intuitive since increased incoming solar radiation should cause increased temperature and yet the data show the opposite. My guess is that there is a time lag mediated primarily by the oceans and possibly also affected by the much greater percentage of land in the northern hemisphere, but I have not read up on the subject. This graph also includes centered running 12-month averages (Run 12) for both TOA SRI and GMST. Figure 2 below compares the CERES TOA SRI with the CFSR Northern Hemisphere (NH) mean surface temperature. The phase of the annual cycle in temperature is similar to that of the global temperature cycle and is nearly opposite the phase of the TOA SRI cycle. Notice that the amplitude of the annual temperature cycle is much larger than the global cycle. Figure 3 below compares the CERES TOA SRI with the CFSR Southern Hemisphere (SH) mean surface temperature. The phase of the annual cycle in temperature is very close to the phase of the TOA SRI cycle, but advanced forward by about a month. Notice that the annual temperature cycle is larger than the global cycle, but not near as large as the NH cycle. Figure 4 below compares the CERES TOA SRI with the CFSR tropics (30N-30S) mean surface temperature, which covers the 50% of the global surface that receives most of the incoming solar energy. The not quite linear cyclical nature of the relationship between SRI and GMST is illustrated by the scatter plot in Figure 5 below. By lagging the GMST by 6 months, the relationship to TOA SRI looks more meaningful, as seen in Figure 6 below. I calculated and compiled annual statistics for each year. During the study period, the 2001-2017 TOA SRI average of the 17 annual averages was 340.023 watts per meter squared (watts/m2) with a standard deviation of only 0.087 watts/m2. The monthly averages ranged from 329.113 to 351.516 watts/m2. The annual range in monthly TOA SRI averaged 21.998 watts/m2 with a standard deviation of only 0.106 watts/m2. The highest annual range was 21.838 and lowest 22.261 watts/m2. The average percentage of the annual range relative to the lowest month each year was 6.682%. Note that I did not bother to weight the annual averages based on number of days per month because I do not expect a significant difference. Similarly, the 2001-2017 average of the 17 annual averages of GMST was 287.810 Kelvin (K) with a standard deviation of 0.133 K and a range in monthly averages from 285.505 K to 289.864 K. The lowest annual average was 287.735 K in 2008 and the highest was 288.051 K in 2016. The annual range in monthly GMST averaged 3.775 K with a standard deviation of 0.166 K and varied from 3.511 K to 4.128 K.
For 2001-2017, the CFSR monthly surface temperature data shows an average annual range of 12.589 K for the northern hemisphere and an average annual range of 5.227 K for the southern hemisphere. The southern hemisphere cycle is only one month delayed from the TOA SRI cycle. Both of the hemispheric cyclical temperature swings are larger than the global swing and include both seasonal earth tilt plus eccentricity effects. The global swing should be the net remainder resulting from the eccentricity induced TOA SRI effect. So, if we assume that the annual range in TOA SRI is the primary driver for the annual range in GMST, then we can calculate that GMST rises (or falls) by 3.775/21.998 = 0.172 K per 1 watt/m2 of TOA SRI change. The implication is that if a doubling of CO2 causes a radiative forcing of 3.7 watts/m2, the corresponding rise in GMST would be 3.7 x 0.172 = 0.635 K and this would include any feedbacks that normally occur in the earth system over an annual cycle. The main difference is that the ramp up in solar input from orbital eccentricity occurs over only a 6 month period each year, whereas the doubling of CO2 might take on the order of a century. However, both are responses to changes to the earth’s radiation balance. So far, I have not been able to think of any compelling reasons why the difference in time scales would make much difference in the resulting effect on GMST. Possibly the short period cycling of the solar input may not allow enough time to reach full impact on GMST in either direction, leading to a quasi-steady state oscillating result? I’m afraid this assessment may be too simplistic or that I may have overlooked some important influences. Thus, I’m not at all certain this approach is a valid method for estimating the effect on GMST from a doubling of CO2. I will be interested hear what readers have to say and I would be especially interested in learning how well the global climate models handle this annual cycling of both TOA SRI and GMST. I’m now seeing that the annual cycle in global temperature is dominated by the seasonal cycle related to the earth’s axial tilt. I thought it might still be possible to estimate the effects of eccentricity on the seasonal cycle in each hemisphere, and from that result, estimate the net effect on the global temperature cycle from eccentricity. However, I found that backing out a rough estimate of the effect of eccentricity actually increased the global annual temperature range, because it increases the NH annual temperature range more than it decreases the SH annual temperature range. Consequently it does not appear possible to determine the effect of eccentricity on global temperature without using a climate model to test the effect of varying degrees of eccentricity. Like many things I’m learning about climate … it is very complex. There has been a sharp decline in the number of Arctic buoys reporting temperature measurements to the global synoptic weather network the last couple of years, as compared to the previous several years. Below are comparisons of synoptic temperature observations for 1200 Universal Time Coordinates (UTC) on January 1 for each year from 2019 back to 2015 for the Arctic Ocean area. The first set of maps below, Figures 1 through 5, are standard plots of weather data, including temperature (upper left from station circle), from the National Oceanographic and Atmospheric Administration (NOAA) Weather Prediction Center (WPC) for the southwestern portion of the Arctic Ocean. Notice the increasing number of open ocean buoys reporting going back each year. Click on any of the maps to see the full size image. Figure 1. Synoptic weather observations for 2019 January 1 at 1200 UTC. Figure 2. Synoptic weather observations for 2018 January 1 at 1200 UTC. Figure 3. 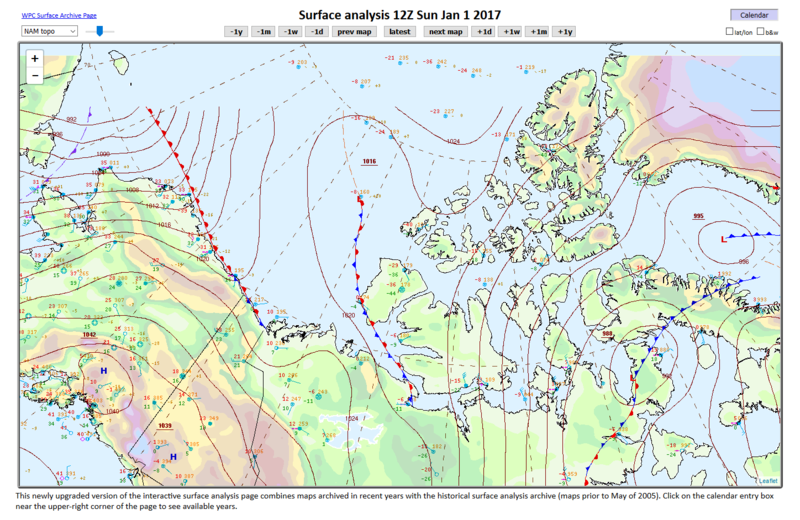 Synoptic weather observations for 2017 January 1 at 1200 UTC. Figure 4. Synoptic weather observations for 2016 January 1 at 1200 UTC. Figure 5. Synoptic weather observations for 2015 January 1 at 1200 UTC. The next set of maps, Figures 6 through 10, show plots of synoptic temperature observations from OGIMET for the entire Arctic Ocean area for January 1 at 1200 UTC for each year from 2019 back to 2015. Again notice the increasing number of temperature observations from the open Arctic Ocean going back each year. Click on any of the maps to see the full size image. Figure 6. 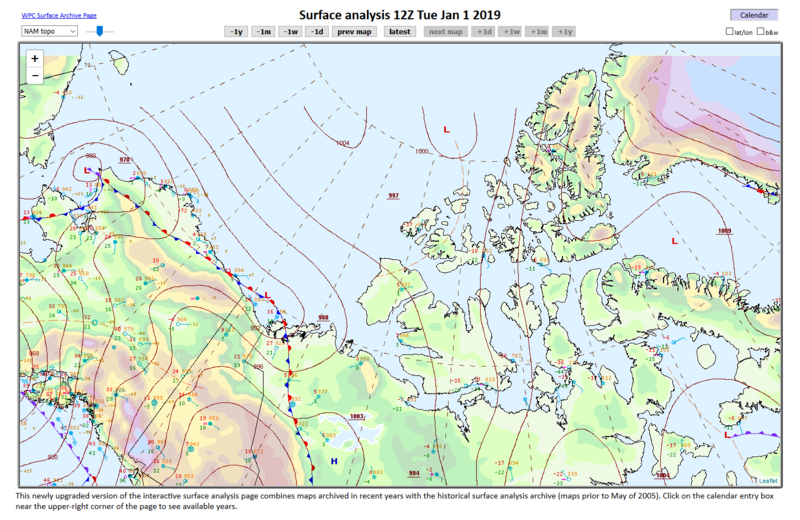 Synoptic temperature observations for 2019 January 1 at 1200 UTC for the Arctic Ocean. Figure 7. 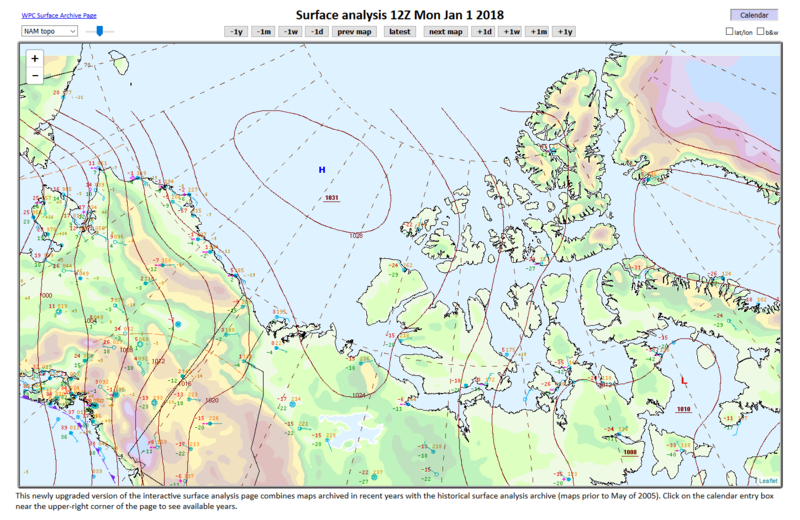 Synoptic temperature observations for 2018 January 1 at 1200 UTC for the Arctic Ocean. Figure 8. Synoptic temperature observations for 2017 January 1 at 1200 UTC for the Arctic Ocean. Figure 9. 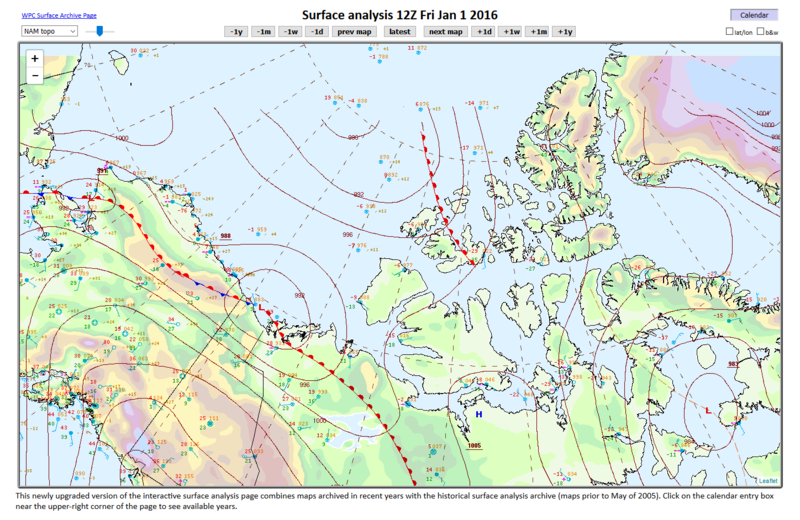 Synoptic temperature observations for 2016 January 1 at 1200 UTC for the Arctic Ocean. Figure 10. 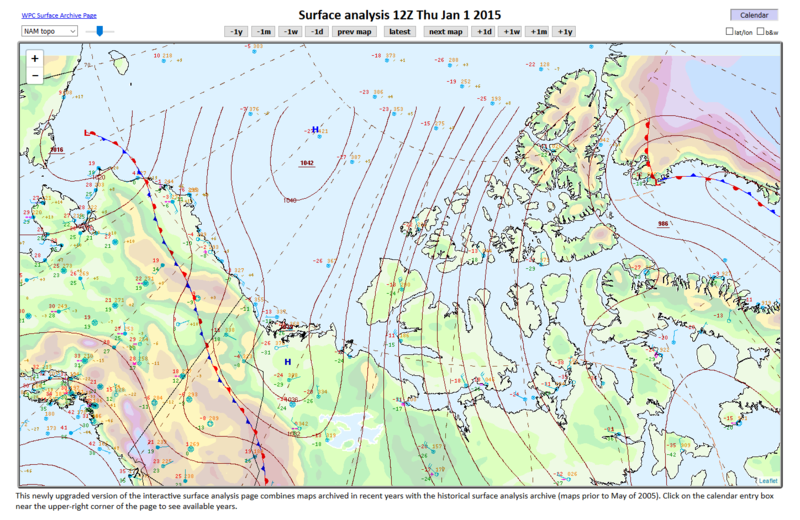 Synoptic temperature observations for 2015 January 1 at 1200 UTC for the Arctic Ocean. Oddly, the most recent International Arctic Buoy Program (IABP) map for 2018 December 27 shows numerous buoys reporting air temperature from the Arctic Ocean area as seen in Figure 11 below. Figure 11. IABP map of air temperature observations for 2018 December 27. Why the temperature measurements from these buoys are not being reported to the global synoptic weather network is puzzling, especially considering that much of the recent global warming has been occurring primarily in the winter night-time Arctic area. I am also not certain whether any of these buoy measurements are being ingested into global weather models and associated reanalyses, separately from synoptic weather data. It would be a shame if they are not. The IABP also provides data and graphs of data from the Arctic Buoys here. In the past I have compared the detailed buoy measurements from IABP to OGIMET plotted synoptic observations and code that were reported from some of the buoys. I found that in some cases the IABP reported “surface temperature” from underneath the hull of the buoy was being erroneously reported in the synoptic data as “air temperature”. Graphs of the IABP data indicate that the “surface temperature” (which is typically from ice or water beneath the buoy) is often substantially different than the “air temperature” when both are reported. I also found flat-lined air temperatures and air temperatures that did not match well with those from nearby buoys in both data sets. But these are different problems to investigate for another day. Notice: the graph in this post has been moved to the Monthly Trends page accessible in the menu bar at the top of this page, where it will be updated monthly rather than by monthly posts. Climate Forecast System Reanalysis (CFSR) monthly global surface temperature anomaly estimates for 2014 through January 2018 from the University of Maine Climate Change Institute (UM CCI) and from WeatherBELL (WxBELL) are graphed below along with monthly global temperature anomaly estimates for the lower troposphere derived from satellite measurements provided by the University of Alabama at Huntsville (UAH). The UM CCI CFSR estimates have been adjusted (UM adj), while the WxBELL CFSR estimates have been left unadjusted to show the difference. The UM CCI CFSR adjusted monthly estimates for June through December 2017 are based on final daily averages and the estimate for January 2018 is based on preliminary daily averages. Most likely the UM CCI January estimate will drop by about 0.10C once final daily averages for January are released. The UM CCI January preliminary estimate at +0.36C was down by 0.04C from December while the WxBELL estimate at +0.26C was down by 0.13C and the UAH estimate also at +0.26C was down by 0.15C. Click on the graph below to see a larger copy. Also shown for comparison are monthly global temperature anomaly estimates from six other major sources, including lower tropospheric estimates from the Remote Sensing Systems (RSS), and surface estimates from the European Centre for Medium-Range Weather Forecast (ECMWF) Reanalysis Interim adjusted (ERAI adj), US National Center for Environmental Information (NCEI), US National Aeronautics and Space Administration (NASA) Goddard Institute of Space Studies (GISS), the UK Hadley Climate Research Unit Temperature (CRUT), and the Berkeley Earth Surface Temperature (BEST), all final through December 2017. All estimates have been shifted to the latest climatological reference period 1981-2010. Final January 2018 global temperature anomaly estimates from RSS for lower troposphere and ERAI adj for surface have been added to the graph. Both showed decreases from December 2017 to January 2018, with RSS down 0.04C, and ERAI adj down 0.14C.